Some emerging trends in healthcare stand to change the landscape of medical real estate. Medical tenants are a fast-growing segment of retail properties. Will shopping centers become the new front line of healthcare provision? The American healthcare system is a slow-moving behemoth. The incentives to evolve, adapt, and compete - trademarks of America's most innovative industries - are all too often missing from the healthcare landscape. Byzantine, third-party payer superstructures (both public and private) dominate the industry. Funding for any given medical service or product is cobbled together from individuals, employers, insurance companies, and taxpayers. It takes an administrative army to calculate the spaghetti-like streams of funds from one place to another. Green shoots sprout up even in this rocky landscape. There is good news to be found amidst the bad. For one, according to Gallup, most Americans are still satisfied with their personal healthcare coverage and quality, despite being much more dour about the nation's coverage and quality. But as Gallup also notes, Americans are very dissatisfied with healthcare funding. Cost and access are the two most important problems, making healthcare an important issue to how 80% of Americans vote. A survey from GE Healthcare found that those most satisfied with the healthcare system are those who interacted with it the least. Seventy-five percent of frequent healthcare consumers are frustrated with the system, versus only 48% of all other consumers. As the survey notes, many other industries are much more consumer-centric than healthcare. The following will highlight one way in which American healthcare providers are positioning themselves to better meet the wants and needs of consumers. And that is the evolving landscape of medical real estate. But first, we set the stage with a few trends affecting consumer demand. 1. Consumerism: As noted in a study by American Health & Drug Benefits, the same consumerism that pervades so many other American industries is emerging in healthcare as well. Moreover, though the healthcare system is still dominated by Baby Boomers and will be for some time, the Millennial generation now outnumbers Boomers by 7.7 million and will continue to increase their share of the total population. Millennials have shown more cost-consciousness in healthcare than previous generations. 2. Health Savings Accounts and High-Deductible Plans: The AHDB article also notes that employers are increasingly utilizing cost-saving plans like health savings accounts and high-deductible plans to put more cost onto the consumer. This will have the effect of increasing the trend of consumerism and cost-consciousness. 3. Shift to Ambulatory (Outpatient) Care: AHDB mentions the secular shift from inpatient care to outpatient care. This shift is due largely to value-based payment models (such as those discussed above) and technological innovations. They note Census Bureau data that shows outpatient care spending grew by 7.3% between 2015 and 2016. There is a trend toward specialization and away from primary care among physicians. Integrative medicine seeks to harness this trend, often organizing medical practices into physicians groups in order to treat patients holistically rather than compartmentally. 5. Cost-Sharing Ministries: One exemption from the individual mandate to purchase health insurance written into the Affordable Care Act was involvement in religiously based cost-sharing ministries. Some of these organizations have existed for decades, but their popularity exploded after the introduction of the ACA. According to the Alliance for Health Care Sharing Ministries, there were only about 160,000 members of these organizations in 2014. As of the beginning of 2018, there were about one million. That's a compound annual growth rate of 84.2%. 6. The Rise of the Nurse Practitioner: Nurse practitioners (NPs) are one of the fastest growing professions, according to the Bureau of Labor Statistics. The total number of NPs has doubled in the last twelve years, perhaps resulting from the combination of increased specialization of physicians and cost-consciousness of consumers. In 2014, there were approximately 205,000 practicing NPs in the US, and by 2025, that number should rise to 244,000. 7. Low-Cost Clinics: Who is hiring all these nurse practitioners? One large employer of NPs is the walk-in health clinic, popping up all over the country in various forms. One of these forms is CVS's MinuteClinic, offering primary care from nurse practitioners and physician assistants in over 1,100 CVS stores across the nation. Demand for these clinics will likely remain elevated. One study from 2015 estimated that 27% of all emergency room visits could have been dealt with sufficiently in a retail clinic. 8. 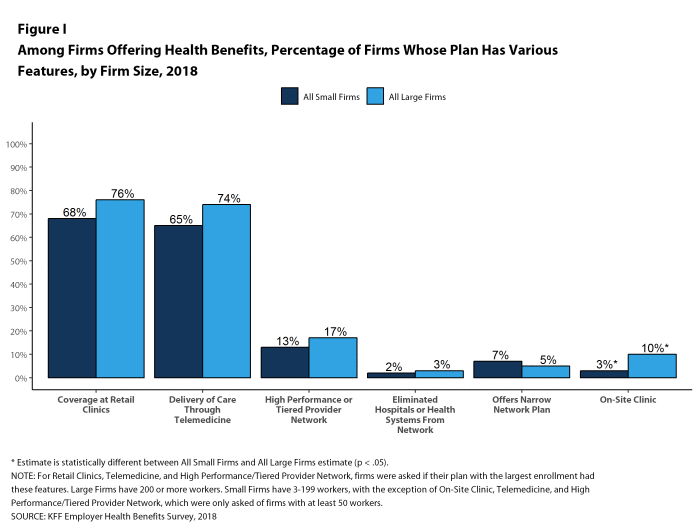 Employer Coverage for Retail/Telemedicine Care: Employer-sponsored health insurance plans are increasingly providing coverage for lower cost options like retail clinics and telemedicine. Two-thirds of small firms provide insurance coverage for these, and three-fourths of large firms provide this coverage. 9. The Berkshire-Amazon-JP Morgan Alliance: This is not so much a trend as a potential future trend. Jeff Bezos, Warren Buffett, and Jamie Dimon and their respective firms (a combined 1.2 million employees) have teamed up in a joint venture to find a way to tackle the gargantuan American healthcare industry and recast it in a way that provides better quality, lower cost, and wider access. They certainly have the resources to make a profound effect, but what that effect will end up being, no one knows. Obviously, there are many more trends that could be noted in the healthcare space. I curated the nine preceding trends because they help explain some of the unfolding movements in medical real estate. This segment [MOBs] has been adding new supply twice as fast as overall office space since 2000. While total office inventory grew by 20 percent, medical office grew by 40 percent, and vacancy rates stand around 100 basis points below that of total office (8.7 percent compared to 9.8 percent). Galdes cites CoStar's Paul Leonard, who comments on this sector's remarkable growth: "Net absorption has not had a negative year for around two decades; it has slowed but never gone negative." This high demand for medical office space is largely driven by demographics. Over the past decade, the 65+ age group has risen from 12.8% of the population to 16.1%. "By 2030, more than a fifth of the population is expected to be over 65 years of age," writes Galdes. And this age group consumes much more healthcare than younger ages. Moreover, as pointed out by Lacy Hunt in the Hoisington Q4 Review and Outlook, population growth came in at 0.6%, an 81 year low. Couples have been progressively having fewer children for decades, and this means that family sizes have gone down. "With fewer family members to care for them in their old age," writes Galdes, "Boomers are more likely to rely on private services than their predecessors." This should steadily increase demand for assisted and independent senior living centers. There are a few reasons to be cautious about the medical office building growth story going forward, however. One is the increasing consumer demand for convenience, accessibility, and cost efficiency that has led to the rise of low-cost clinics and telemedicine providers. Another is the shift in location/setting of outpatient facilities from medical office properties to retail or mixed-use centers. According to CoStar data, "while most medical tenants occupy office properties (70 percent), the next largest category is retail property (18 percent), with the remaining 10 percent occupying industrial and flex or R&D properties." Medical tenants occupying retail spaces have doubled in the past decade, increasing their presence in retail at twice the rate of office space, says Galdes. "In 2008, only 1.5 percent of retail occupancy was medical, growing to 2.3 percent in 2013 and to 2.9 percent in 2018." Retail: The Future of Medical Offices? Retail-oriented mixed centers are somewhat rare due to the more specialized construction required as well as the additional licenses needed from local governments. Not all governments even allow medical tenants to mix with retailers in the same buildings at all. The City of Beverly Hills, for instance, passed an ordinance in 2011 disallowing medical tenants to occupy either retail or general office properties. Other cities disallow the mix based on zoning restrictions. But many see the trend as inevitable. Jake Rohe of Pacific Medical Buildings, for example, thinks the mix of medical and retail tenants make sense. Many retailers like having healthcare in the mix because of the increased traffic, either in the form of patients coming to or from appointments or those dropping off patients who might do some shopping while they wait. This was the idea behind Athletico Physical Therapy opening a location in a St. Louis shopping center beside big-box stores like World Market and Target. This trend of non-traditional tenants filling space in retail centers seems poised to continue for many years to come. Galdes says "the top industries for medical office in retail are dentist offices (18.2 percent); offices of other health care practitioners (17.5 percent); outpatient care centers (9.7 percent) and physician offices (9.3 percent)." For investors interested in REITs, there are two primary takeaways - two trends to watch - from the preceding analysis. The first trend to watch relates to medical office buildings (HTA, HR, DOC). Both supply and absorption have been impressive for the MOB space in the past few decades. However, if lower-cost, consumer-centric trends such as telemedicine and retail clinics take off, this could eat into MOB tenants' business. Currently, doctors' offices receive revenue primarily on a fee-for-service basis. Each doctor visit results in a payment, either from the patient or the insurance company or the government. Each time a patient chooses to stop at the local clinic instead of scheduling an appointment with their doctor, then, MOB tenants' revenue is diminished. I will be interested to see if integrative medicine can draw consumers back into MOBs - or if integrative medicine can take off at all. The second trend to watch relates to shopping centers (FRT, REG, KIM, EPRT, BRX, MAC, TCO, UBA). While medical tenants currently make up a very small percentage of shopping centers, it will be interesting to see if landlords compensate for the slow-moving retail apocalypse with healthcare tenants. This shift would probably involve increased tenant improvement (TI) costs but may be preferable to vacant space or lower-quality retailers. Certainly, the trend is toward an intermixing of retail and medical tenants. This could provide considerable upside for shopping center REITs who choose to reposition some of their properties toward this type of mixed-use. And it also may benefit healthcare providers through lower rent and enhanced patient convenience. Here is one potentially actionable takeaway from this analysis: Cheaply valued shopping center REITs may not have such a dire long-term outlook as the "retail apocalypse" narrative supposes. Much has been said about how "over-retailed" we are in the US. But this may not be true if healthcare tenants continue their movement into retail spaces. However, it would seem wise to wait and see if publicly traded shopping center landlords begin to integrate healthcare providers into their tenant base. So far, there has been little movement in that direction. In any case, it definitely appears as if we are headed toward a more mixed-use future in retail real estate. Disclosure: I am/we are long HTA, DOC. I wrote this article myself, and it expresses my own opinions. I am not receiving compensation for it (other than from Seeking Alpha). I have no business relationship with any company whose stock is mentioned in this article.